Kathy Brewster and Malania Kehl: Story of Bigfoot. 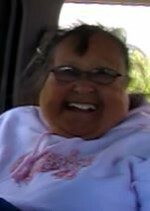 Rhoda Moonin: Changes in Nanwalek. It started out in Port Lock, when people started coming over to the Nanwalek area. One of the men that followed along fell asleep in the bow of the skiff. He woke up just before they arrived in Dogfish. He asked to be dropped off there. As they were about to beach, the man told them to not follow him because he was turning into a Bigfoot. They did as he said and continued on their travels. The people soon met up with the same man in the lagoon area of Nanwalek. The man had told them to not let their wives out of the house, but to stay inside and keep a close eye on their children. If the wives were to leave the house, he said he would take them away to never be seen again. The man stayed in Nanwalek for a long time, he walked around, but he said he didn’t want to be seen. He changed his skin for furs. After his time in Nanwalek, he started moving to 1st lake, 2nd lake, then back to Dogfish, where he originally came from (where he was originally dropped off on the beach). By that time, he had started transitioning into an actual Bigfoot and would visit these areas mentioned. He had changed so much, the people barely understood him because he was whistling so much. He said to them that they were lucky that they weren’t becoming a Bigfoot. Now, people only see him at the end of the airstrip. Malania tells of how four hunters went on a duck hunt down at the end of the airstrip. While they were down there, they heard someone whistling at them. One of the hunters, Mickey, whistled back. They soon saw a bear charging at them. Because the whole village is Russian Orthodox, they wear crosses around their necks. The hunters bit on their crosses, (then took it out of their mouths and) spat (in the direction of Bigfoot), flung the crosses around on their backs, and run back to their homes. All four hunters made it home safely, although, Mickey, the one who whistled back at the person, got terribly sick. Luckily, Grandfather Nicolas Moonin was a priest and restored his health by blessing him and giving him holy water to drink. Fr. Nicolas then went to the area where they saw Bigfoot and blessed that area too with holy water. This story was told to teach the young ones to be wary and always stay with their parents. The parents watched over them, they took steam baths together, fed them, and put them to bed. Rhoda Jane Moonin, daughter of Juanita Melsheimer and Sargus Kvasnikoff, born in Nanwalek. As she grew up, Nanwalek was a very small village; there were no Hondas (all-terrain vehicles or ATVs) or trucks. If anyone were to go anywhere, it was by boat or skiff. Nanwalek was a very quiet place and people helped each other out a lot. They would ask one another if they needed anything or help with any tasks. Aside from Rhoda’s parents, her aunts and uncles made her and her siblings work hard doing dishes, washing clothes, and keeping the house clean. 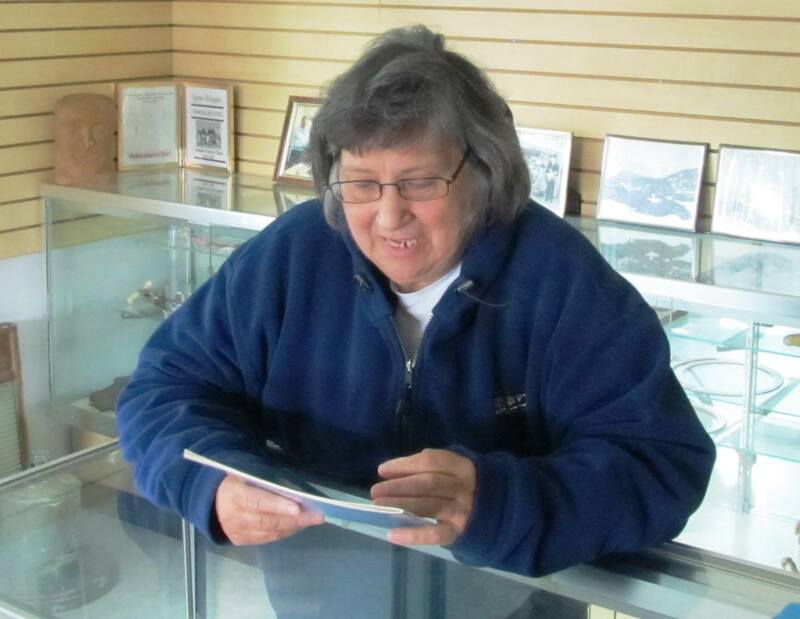 Growing up, Rhoda rarely heard English spoken in the house, let alone in Nanwalek. Everyone spoke Sugt’stun. She even tells of how her father came from Ninilchik speaking Russian. Once Sargus and Juanita married, he started picking up Sugt’stun, and tried the best he could. Together they had 13 children. They lived in a small house near the beach area in Nanwalek. Rhoda describes the attic in her old house and how she would be mischief by playing up there when she wasn’t supposed to. In 1964, there was an earthquake, and her mother, Juanita, rushed them to the school for protection. Everything was shaking, the kitchen table, everything moved. From then on, the people moved and rebuilt houses higher up on the hill. Once her parents separated, Rhoda moved to Anchorage, where she and her siblings were intensely exposed to the English language. She enjoyed school there, although she was homesick and longed to speak Sugt’stun. Eventually, she moved back to Nanwalek (back then English Bay). At that time, Jeff Leer, a (now emeritus) linguist from the University of Fairbanks, was there working on the orthography for the Sugt’stun language. In the 8th grade, Rhoda received a certificate saying that she can read and write fluently in Sugt’stun. Rhoda remembers how proud she was! After the 1964 earthquake, BIA came in and built small houses with plumbing for everyone. They also introduced electricity, VHS, and a water system to Nanwalek. The roads were widened after having a military truck there. Rhoda remembers of how Herman (Moonin) and his wife Kukku owned the first TV. Rhoda and her husband got married and soon had the same set up near this couple on the hill in the new housing area. Rhoda reminisces of how her and her sisters would pick berries in that area where the new houses were built, and how it was such a great spot, but it was ruined by the houses that are built on top of them. Nanwalek started to grow bigger and bigger, relatives returned home with their husbands or wives and children. It began to change so much, English became the prominent language instead of Sugt’stun, and everyone had a Honda or truck. Thankfully, BIA had built an IRA (Indian Reorganization Act) Council office building as well, and the government helped out with people with different kinds of support. Local people are still mocked sometimes because they continue to speak Sugt’stun. For this reason, they are sometimes ashamed to speak Sugt’stun and a lot of the older words have been lost or forgotten. Easter, and preparation for Pascha, is the most important (religious) time of the year for Orthodox Christians. Nanwalek also observes this feast with great reverence, and appreciation. This section focuses on the Paschal Troparion – “Christ is risen from the dead, Trampling down death by death, And upon those in the tombs bestowing life.” In Nanwalek, it is sung during the Russian Orthodox Easter Service in three languages: English, Russian/Church Slavonic, and Sugt’stun. 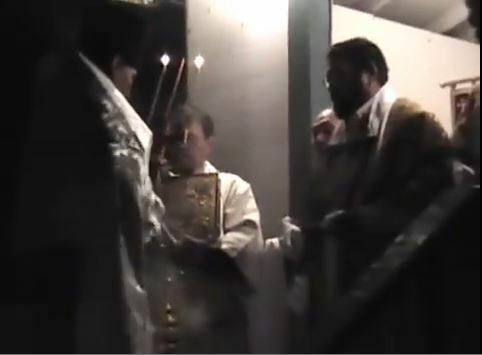 The segment captured in this video is from the Paschal Vigil during the procession around the Church. Fr. Sergei Active sung the troparion the first time for that year and it was followed by the Psalms.